The power ambitions and competitions of the elite are highly asymmetric. Political science and political scientists, among others, could play a major role in resolving Sri Lanka’s most important problems like post-war ethnic reconciliation, construction and reconstruction of democracy, and overcoming dangers of authoritarianism through critical thinking, scientific research and lucidly written publications aimed at supplying inspiration and new thinking to policy makers and the public alike. 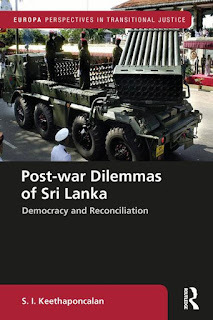 The value of the new book by Dr S. I. Keethaponcalan titled ‘Post-war Dilemmas of Sri Lanka: Democracy and Reconciliation’ can be assessed particularly in that context although its importance undoubtedly goes beyond the shores of Sri Lanka. Keethaponcalan teaches conflict resolution at Salisbury University, Maryland, USA, and recently held the Chair of the Department of Conflict Analysis and Dispute Resolution at the same university. Before joining Salisbury University in 2011, he was Professor and Head of the Department of Political Science and Public Policy at the University of Colombo and held several international assignments in the fields of conflict resolution, peace studies, transitional justice and disarmament throughout years. His recent most two publications – ‘Conflict Resolution: An Introduction to Third Party Intervention’ (Lexington Books, 2017) and ‘Violence, Nonviolence, and Ethnic Reconciliation in Post-war Sri Lanka’ (Peace & Policy, 2015), stand most relevant to the present study and publication. The present book is a Routledge publication, London and New York, just out. In the investigation encompassing the book, Sri Lanka appears a case study but a fitting one. It is fitting not only because it is the author’s home country, but because the ethnic conflict and the war have had a protracted character and consequences. Even after the end of the war in 2009, the progress or rather the events have been tortuous, contradictory and uncertain. With an undoubted focus on Sinhala-Tamil ethnic reconciliation, the approach of the investigation challenges a popular conception or a myth that the ethnic conflict could be reconciled automatically by making Sri Lanka more democratic or economically developed. These are the conceptions that the author has challenged and refuted. This is also the novelty of the book that the author has compiled, without neglecting the Muslim question. This does not mean that the author has disregarded or disputed the importance of democracy or economic development for reconciliation, but has emphasized the need to go beyond and engage more directly in proper conflict identification, dialogue, negotiations, peoples’ involvement and conflict resolution. There are so many other merits, values and uses of the book, theoretically and empirically. As the author says, “The end of the war had a profound impact on post-war governance and ethnic relations in Sri Lanka.” He has highlighted more of the way the war ended which is one of the reasons for the continuing reconciliation problematic. His profound chapters on the subject of post-war dilemmas, written from the perspective of reconciliation throw light on this matter tracing the history of events, the characterization of two types of post-war regimes and the emergence of new fault lines between the Sinhalese and the Muslims. 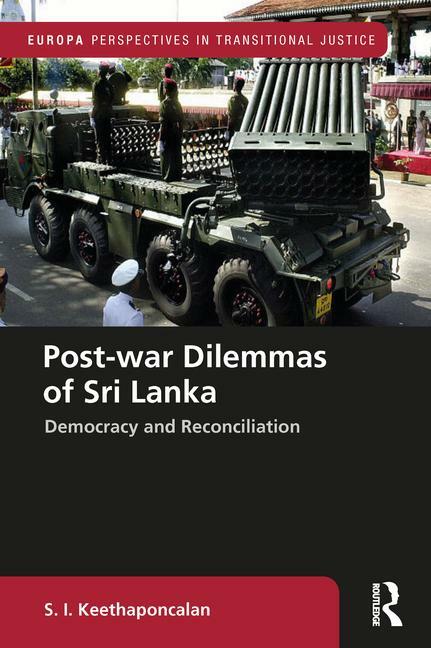 The book consists of six chapters: (1) Theoretical overview, (2) Ending the war: a zero-sum situation, (3) Democracy: a struggle, (4) Reconciliation: a distant dream (5) Sinhala vs Muslim: a new frontier, and (6) Conclusion. The theoretical overview would be immensely useful for political science and conflict resolution students. Others are equally useful for political leaders, peace activists, international observers and future researchers, apart from the students in the field. This review cannot cover all, but some aspects of the book. In discussing the ‘zero-sum’ ending of the war, the author without limiting to the ‘how’ questions, has investigated ‘why’ the LTTE got defeated. There are three main reasons given: (1) the strategies of the Rajapaksa government, both militarily and politically (2) the delegitimization of the LTTE within the Tamil community and the emergence of military weaknesses, and (3) the international support extended to defeat the LTTE although ambiguous at times. This is a valuable analysis on the ‘end of the war’ from a political scientist, who has had immense experience in the North. There is a major portion of a chapter devoted to trace the democratic degeneration under Rajapaksas involving power consolidation through electoral processes, instituting quasi-family rule, the centralization of power via constitutional tinkering, and bringing the judiciary, the media, and civil society under control. It is in the same chapter that the intended ‘Democratic restoration?’ after 2015 is discussed with a question mark. Why a question mark? The author admits that the manifestos of the opposition that came to power in 2015 in two elections were quite broad and entailed ‘peace, reconciliation, constitutional reform, the elimination of corruption and the reduction of living costs’ and many more things under the rubric of good governance. It is true that considering the protracted degeneration that the author himself has traced, the restoration of democracy and good governance is not an easy task. But was it completely correct to place the tasks of ‘national reconciliation’ within the same bag and consider it just easy and ordinary? These are specialized areas that should go beyond political rhetoric in the author’s indication. The author has mainly investigated the conflict problem as a confrontation or mismatch between different communities and thus the reconciliation as a matter of those communities coming together. While the political factors underpinning the conflict have been thoroughly investigated what has been beyond the scope of the book is the proposition or hypothesis of ‘conflict as a confrontation between political elites for political power.’ That kind of a hypothesis or assumption speaks for the partial validity and also the monumental weakness of the present efforts for political-elite reconciliation through alliances and co-habitation. The power ambitions and competitions of the elite are highly asymmetric. The hegemonic disposition of the Sinhala-Buddhist elite is overwhelming and uncompromising, apart from extremism and idealism from the other sides. The situation is very clear from the analysis that the author has made on the new frontier, the Sinhala vs Muslim fault lines. The investigation and the analysis is up to date. After covering the historical background, also tracing the Tamil-Muslim hostility, the author has given a comprehensive account on the anti-Muslim riots in recent times. It is with this Islamophobia and also counter extremism, that reconciliation has again become problematic and a distant dream unless the political leaders, political activists and the concerned international ‘players’ employ more realistic and constructive approaches. What the author has concluded at the very end is the following.